I still haven’t got around to making a video about what I bought in Singapore, but in the meantime here are a couple of things that are currently floating my boat. You can watch my vlog about the trip here by the way, which details some of my shopping shenanigans! A couple of things to note about shopping in Singapore. Wear flat shoes for the love of god – there are so many malls, all side by side, and the sheer amount of people means there’s very little strolling, and lots of speed walking. Everything is cheaper than Dubai – this was evidenced by a pair of shoes I spotted in Zara here just before we left for AED350. In Singapore they were AED220. They have every brand you can ever think of, ever. This will result in lots of ‘OMG!’ and ‘Eeeeeee’ noises. Anyways, speaking of brands – I came across a Shu Uemura boutique a couple of days into the trip and just about lost my mind. I bought skincare, foundation, BB cream – I bought it all. One of the products I picked up is really incredible however, and deserves a special mention. 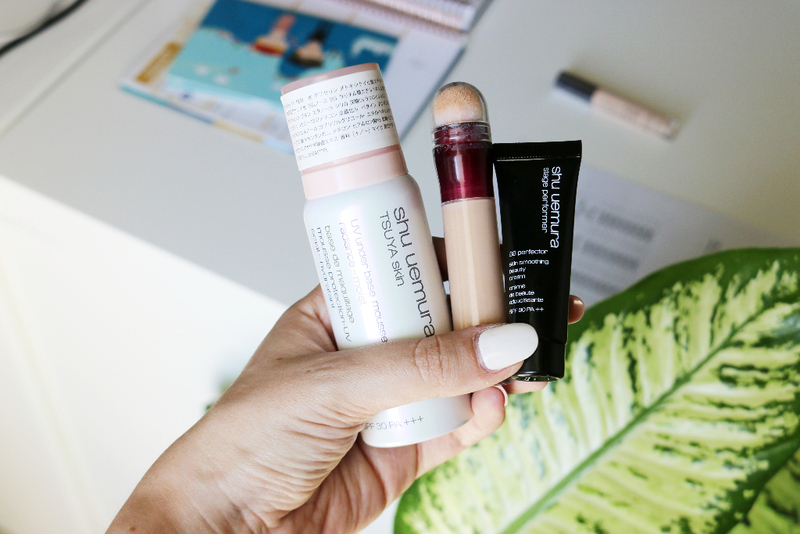 Shu Uemura Tsuya Skin UV Under Base Mousse – a delicious smelling, lightweight mousse that feels hydrating on the skin and leaves the most beautiful glowy finish – and this is before you apply your foundation over it. It also gives SPF30++ protection. It’s just so good. I don’t know what else to say about it. It’s available in a handful of shades from what I can gather, depending on whether your skin has pink or yellow undertones. Watsons was next on my hitlist – a pharmacy/mini department store that’s similar in vibe to Boots but much, much better (with lots of stores all over the city). Aside from hauling the usual weird looking facemasks/eyelashes/quirky new makeup gadgets, I picked up Maybelline Instant Rewind Eraser Dark Circle Treatment Concealer (why they just can’t call it ‘concealer’ I don’t know). I expected to be blown away because of the sheer amount of gushing reviews online, but I’m not overwhelmed. I’m not underwhelmed either. I’m just ‘whelmed’. I would also use the term ‘meh’. It’s fine, it gives a nice little bit of coverage, but it doesn’t last long and the squishy applicator gives me the creeps. Have you tried it? I feel like I’m missing something. Maybe I’m applying it wrong? And then, after I bought all of the makeup, I bought a(nother) pair of Converse. But these ones are special, these ones have eluded me for months and months, despite much internet stalking (dainty Converse are thin on the ground in Dubai, no pun intended). They are everything I thought they would be (and much, much cheaper than expected). As many of you know, I wear black almost every day, despite my sunny disposition (!) and I have always felt that black Dainty’s would be the icing on my ‘Summer blacks OOTD’ cake. I have white Dainty’s and I have navy Dainty’s, and while I love them both, they never quite managed to fill the void. These beauties do, and they go with everything, and now everything is right with the world once more. 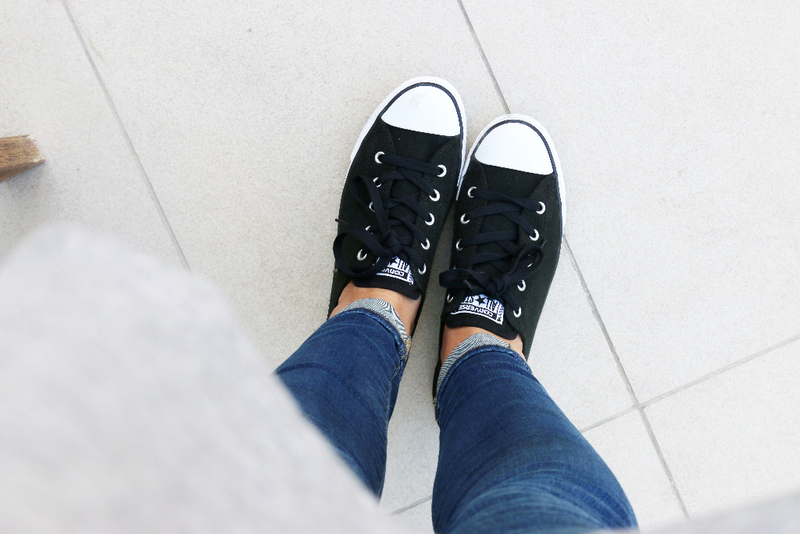 If you’re a Converse fan like me by the way, and you haven’t converted to the Dainty style yet – do it now. You won’t regret it. They are much more comfortable than the original style, and I think they go with everything, including dresses, skirts, etc. Lastly, a book mention. On the plane on the way to Singapore I read A Quiet End by Nelson DeMille. I grew up reading his books, as I’m a huge fan of the John Corey detective series. If you like clever, fast-paced crime novels that are heavy on sarcasm, you’ll love this. Once I finished it, I immediately wanted to get into another book, so that’s what I’m trying to do now. 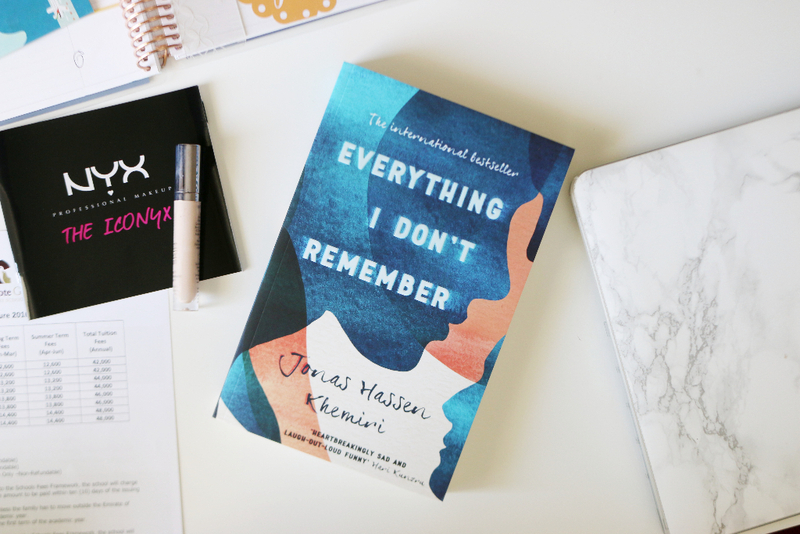 Everything I Don’t Remember by Jonas Hassen Khemiri was on the bestsellers list in Kinokuniya in Singapore. Apparently the Author is one of Sweden’s finest so I have high expectations. The writing style is quite different and jumps from small paragraph to small paragraph about each of the characters and tells the story from their perspective. I’m a couple of chapters in and quite enjoying it, although you have to be very plugged in when reading it, if you know what I mean. The story is about a mysterious young guy called Samuel, and his subsequent death, and the memories that each of the characters have about what happened. What are you reading at the moment? If you have any book recommendations for me please send them on and I will duly search them out. I’d like to get through a few before Dubai gets back to full speed again in the next few weeks. I quite like the maybelline instant rewind concealer thingy, maybe it’s meant for lazy make up girls like me I’m particularly fond of the brightening one which is especially good for making me look semi-human when I don’t have time or the inclination for more make up (which is er, most days..! ).